In the previous MPN Life column, I introduced you to the Crawl phase of exercise. This month I will cover the final two phases Walk and Run. I love the month of September. It marks the beginning of fall and the leaves begin their magnificent change in color. Every fall, even out here on the West Coast, I am reminded of my times of innocence with my brothers and parents living in Weston, Connecticut. A time prior to our parent’s divorce and later passing. Our return from summer vacation from either Cape Cod or Fire Island, just as Labor Day Weekend draws to a close. The long hot and humid East Coast summers finally draw to a close. Best of all the leaves begin to fall. While it all happened so long ago when I close my eyes I can still see my Dad raking the leaves from our front lawn and in to one giant pile that my brothers and I could run and jump in to together. The smell of the leaves is still there when I landed at the bottom of the pile. I recall it sending with work of course. Someone would have to put all the leaves in to a trash bag and that was the three of us did. Of course we complained at first. Hey we are Jewish! But my brothers and I knew Mom would soon be setting the table for lunch and the smell of her home made meals would make all of our work so worthwhile. So why all of this September talk and what does it have to do with exercise? Glad you asked. September is one of the best months for exercising and being outdoors. In addition to the changing of the leaves the temperatures begin to moderate and make for excellent outdoor excursions. I will take the outdoors any day over the gym. Just think about walking, running or cycling through here. The stress of dealing with the combination of the MPN diagnosis and fatigue and can in many cases leads to varied forms of depression. For those on INFN these next two phases offer additional benefits to guard against depression. When you exercise your body releases endorphins. These act as analgesics and when released can reduce the awareness of pain as well. The more you exercise and the greater your intensity the more impact endorphins have on your body. Intensity is an important word to get to know because it’s your friend. Without a goal of increasing your exercise intensity you will reduce your ability to restart your bodies immune system and slay fatigue. 2. Less anxiety and feelings of depression. 8. Improves muscle tone and strength. 9. Strengthens and builds bones. 10. Helps reduce body fat. 11. Makes you look fit and healthy. Remember never skip a phase and if you are uncomfortable moving up stay with a phase until you are. You set the stage for which phases you want to place yourself and how rapidly you are capable of moving through each phase. At the beginning of any exercise program or changes to your existing program always check with your Doctor prior to changes in your exercise program. Walk is the most important phase of Crawl. Walk. Run. Walk is the first time you will increase the intensity of your exercise program. I will talk more about intensity, one of the single most important aspects to exercise a little bit later. If you work hard at this you will now begin slaying that beast called fatigue. WARNING: When you move from Crawl to Walk this is the first time the risk of a potential injury really comes in to play. If you are doing things incorrectly in Walk, such as lifting too much weight or when cycling, riding with your knees bent outwards. You will create bad habits that will stay with you and unfortunately can increase your risk of injury. IF you have any questions about this let me know. In Crawl you are training yourself to get ready for Walk. In Walk you are training for RUN. Take your time with Walk and do not rush it. There is no time limit on the transition from Crawl to Wall to Walk to Run. Only you know how your body is feeling and reacting. This is a good time to take notes on where you are sore so you notice the changes in your body and don’t mistake it for something else. Always take time to appreciate your accomplishments as well and share them with our Facebook Forum group for inspiration and support. Two of the biggest changes in the Walk phase are the intensity and time you devote to exercise. Lets talk about intensity first. Exercise intensity refers to how much work is being done when exercising, the rate as which you exert yourself during exercise. Results are most often measured as the percentage of maximum heart rate (MHR) and your heart rates beats per minute (BPM). I do not expect any of you to hit a 90% plus heart rate in Walk. That is fir Run. At the 120 days point of Walk, you should be begin to reach the 80% level. This assumes you have no medical issues, which prevent you from achieving these results. Again always check with your Doctor prior to targeting these rates. You can start with a three-day a week program and depending on your intensity and commitment you will see some reduction in your fatigue. You will definitely see improve overall results in your health but fatigue is a much more difficult challenge. Only a five or six day program will provide you with the amount of energy you need to blow off fatigue. The good news is if you really commit to this phase you will reduce your fatigue. Energy will begin to come back in ninety days. People love hearing gardening and walking are considered exercising. There has been some misperception presented in articles that link the simple act of burning calories to exercise. Gardening is a wonderful experience and you should continue doing it but don’t confuse burning calories with exercise. You burn calories while sleeping yet I don’t know anyone comparing sleeping to exercise. Raising your level of intensity is necessary to improving your health and ending fatigue. Remember you are looking to being your heart rate up when you exercise and increase your intensity. This just doesn’t really happen very often while you are gardening unless you are chasing your husband or wife around the garden with a rake. Run. The final and in some ways the most difficult phase to maintain unless you are committed to a 6-day a week plan. When I say a 6-day plan this does mean you cycle or swim six days a week. You want to mix up your workout program to include various types of cardiovascular work along with some weight training. The most common plans are divided up in to six days. For example you might do your cardio work on Tuesday, Thursday and Saturday. While you use weights Monday, Wednesday and Friday. As I mentioned in August studies point to those who exercise less than five or six days a week see the highest rates of discontinuation in their exercise programs. By now you should be planning on a minimum of 45 minutes to 1 hour of exercise each day. Consumer Reports Health recently wrote about new studies that show the US Governments recommendation of 20 to 30 minutes of exercise need to be revised. Its just not enough time especially when you factor in the bodies ability to adjust itself along the way. You must extend your time spent exercising to improve your body’s ability to heal itself. You must also build time in to your plan that includes resting your body, as it will need it for recovery. I try not to cycle back-to-back days at high intensity. Not allowing your body to restore itself and can weaken your immune system. I always take one day a week off and when my body needs it I rest two days. You should be in shape now, and with your Doctors permission of course to begin testing your heart rate at 90% to 100%. New studies have found that increases in intensity do not need to be demonstrated through the entire time you are exercising. Short intense bursts of exertion, a maximum heart rate greater than 90%, for three to five minutes followed by 10 to 15 minutes of normal exertion are more effective than an all out exercise at 90% until you drop session. In the run phase you will need to spend additional time making sure you take of your nutritional needs. For example while training for my back to back weekend rides I made the mistake of not refueling properly, which brought on some really painful stomach pains. When I checked my Garmin 500 I had burned 2400 calories yet all I ate was a banana on the ride, one bar and three bottles of water. I had let my tank run dry. Sure I was hydrated just fine but I was starving myself. When I rode the back to bike rides this month I burned 1589 Calories on Saturday and 1798 Calories on Sunday. But this time I had my water bottles filled with Heed (the Heed product I was using replaces your electrolytes) in addition to having three bars with me I stopped at every rest stop along the ride and made sure I replaced my calories. It’s very important to manage and balance your expectations. If you do not you may become discouraged. For example some people will be able to participate in Marathons and Triathlons while others may only be able to complete half marathons no matter how hard they try. Some of you will run 8 miles while others may run 1 mile in a day or walk 1 mile in a day. All of this is excellent and you should not beat yourself up if you never make it to the top of the mountain again. This is not about training for the Olympics it’s about bettering your overall health, reducing fatigue and improving your quality of life. Which for one person might equate to running 1 mile a day or 1 mile a week. The Walk phase is not just about beating fatigue, losing weight and improving your cardiovascular levels. If I have made one mistake in my exercise life it’s not adding enough muscle. As we age study after study bares out the need for most of us to add muscle to our bodies. No I am not asking you to become Arnold Schwarzenegger but adding muscle and toning your body is very important to your health. A side benefit of building muscle is unlike fat muscle burns calories even when you aren’t exercising. This will help you more easily maintain your proper weight. So how do you add muscle? I could write a column just on this subject but lets stick to the basics. Most people in a gym constantly are either looking at themselves in the mirror look or are checking each other out. If you remember being single, it pretty much the same thing. Ignore all of these idiots. We are not in a competition. Rule #1 when you first start lifting weights if you have not lifted weights in a long time do not start out trying to lift buildings. I know gyms can be intimidating if you let it get in your head. Please let the other people in the gym injury themselves trying to impress you. 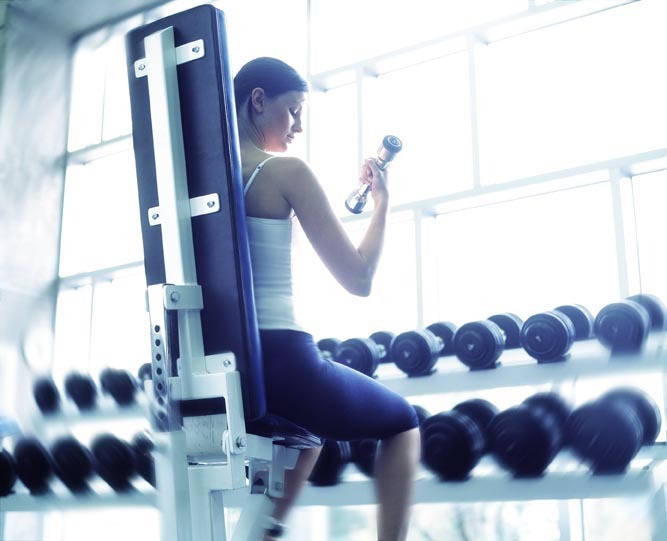 Hiring a trainer can be a good place to start if you are doing your weight training at a gym. Whether or not you want to hire a trainer is up to you but make sure you ask the trainer for references prior to hiring anyone. When you walk in to most gyms you will generally notice the free weight section and the machines. Companies like Naultius make the machines and there has been a debate for many decades over the advantages of free weights vs. machines. Nothing is better for building muscles than free weights and what most people do not realize is that most gyms have free weights as light as 5 LBS now. The picture below shows a woman working out on a bench with very light weights to tone her muscles. Some of the strengths with machines are their ability to work with you on your legs. Below are some explanations of the equipment from the http://www.livestrong.com. A hip abductor machine uses a push force to strengthen and sculpt your outer thighs. The abductor machine is available in standing and seated versions as well. Seated leg presses can be performed using weight plates or weight stacks to target your quadriceps, hamstrings and glutes. Your foot placement on this machine will determine the area of concentration throughout your thighs. The most common placement is feet positioned shoulder width apart; the primary muscles trained are the quadriceps, while the secondary muscles involved include the hamstrings and glutes. Perform two to four sets of eight to 15 reps. The leg extension machine isolates the tops of the thighs, or the quadriceps. To effectively strengthen each leg, choose an iso-lateral version or work one leg at a time. To add variety to your routine, alternate between full range and short range of motion, vary your lifting speed or hold and squeeze the muscle at the top of the movement before releasing. Perform two to four sets of eight to 15 reps. The leg curl machine isolates the backs of your thighs, or the hamstrings. To prevent static activity and boredom, incorporate both full and short range of motion. Also, consider keeping your toes dorsa-flexed during the movement to maintain full contraction of the muscles; this results in minimal rest for the hamstrings. Perform two to four sets of eight to 15 reps.
As you progress through Walk and Run and increase your intensity your overall health is going to improve, your going to lose weight, provided you eat right as well. You are going see some pretty impressive results on your lab tests. Lower blood pressure and LDL as well as an increase in your HDL. It is a long list of results. However, do not expect miracles. You Bone Marrow will not heal itself. But the blood that flows through your veins will find it much easier to the move through your arteries and your hearth will purr along like a new engine in your vehicle. You brain should also become more focused and memory should improve. When I made it to the Run phase my LDL dropped by half and I doubled my HDL. My average blood pressure is 110 over 55 to 60 when I stick to working out hard six days a week. In addition the debilitating fatigue I had is but a memory. My improved cardiovascular and nutritional changes allow me to participate in events with my family and friends. 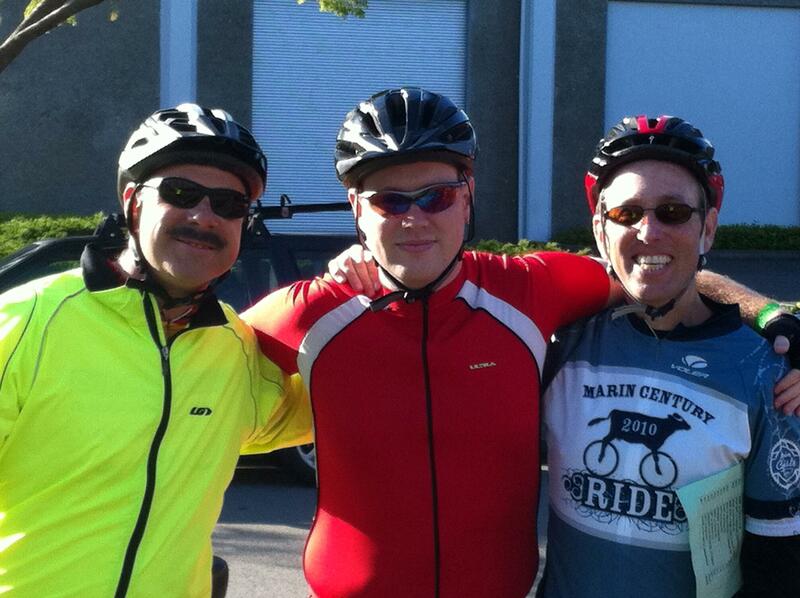 The picture below was taken this year of me with my son and brother in-law on our 37-mile ride through Healdsburg, CA. In case you were wondering I have kicked my son’s rump up and down every hill. Where he crushes me is out in the flatlands. But I am working on it! I still have a lot of room for improvement and five years ago I would have never thought I would be able to ride at this level again. Most importantly I am having a hell of a lot of fun while improving the quality of my life. I challenge you to find out which level you can reach. Whether it be Crawl Walk or Run it does not matter. All that matters is you remember this is about fighting back and creating the quality of life you want. Exercise can allow us all to reach that goal however you define it. Please communicate via email or MPN Forum or at our Facebook Forum http://www.ourmpnforum@groups.facebook.com with your questions, comments and stories of success.